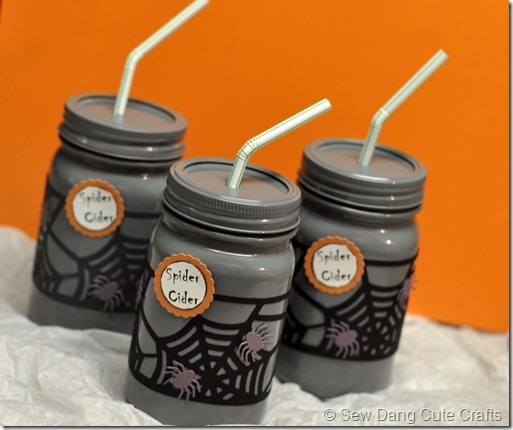 Tam used some cute die cuts to create these fun Halloween Mason Jars. She spray painted them grey, but I would leave them clear and put a fun orange or green punch inside to show through the spider web. I LOVE the spider web idea! You could even use it on a regular clear plastic cup if you don't want to give the kiddos glass. I am pretty sure with a little tweaking you could use a cupcake wrapper around the clear plastic cups. You can check out a tutorial these cute mason jars over at Sew Dang Cute. Really cute idea. I see lots of possibilities here. Thanks Lorie! I love the idea of an orange or green drink showing through! !